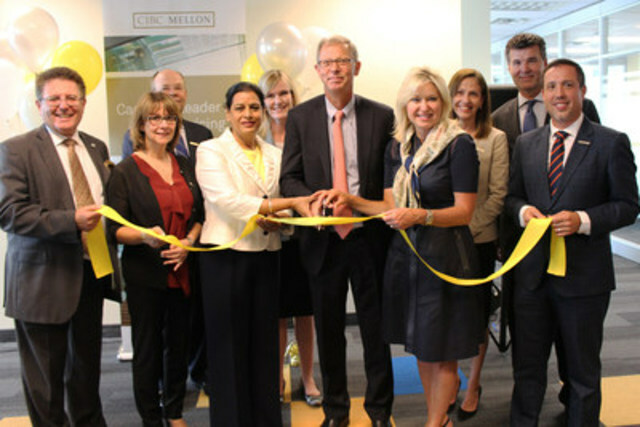 MISSISSAUGA, ON, Aug. 12, 2016 /CNW/ - CIBC Mellon today announced that its new office in Mississauga, Ontario has opened, bringing more than 150 accounting, client service, operations and related professional roles to Canada's sixth largest city. The company is transferring a number of experienced employees from its downtown Toronto headquarters, while continuing to recruit promising young talent and experienced professionals in the Mississauga area. CIBC Mellon will provide a range of client services from the Mississauga location, including custody services, and institutional and pension accounting. "Expanding into Mississauga is in keeping with CIBC Mellon's continuing growth as a leading provider of asset servicing solutions to pension plans, insurance companies, investment funds and other institutional investors active in Canada," said Richard Anton, Senior Vice President and Chief Operating Officer, CIBC Mellon. "CIBC Mellon is committed to a great employee experience and continually working to be an employer of choice. We chose to expand in Mississauga because it is highly accessible, with many great local amenities and a thriving business community." "CIBC Mellon is an outstanding employer, and we are pleased to welcome them as they bring hundreds of great jobs to the Mississauga area," said David Wojcik, President and CEO of the Mississauga Board of Trade. "CIBC Mellon's move is one more example of Mississauga being a great place for successful businesses, and they join Mississauga's 60 Fortune 500 Canadian headquarters and more than 50,000 businesses." "On behalf of the City of Mississauga and Members of Council, we would like to congratulate and welcome the team of professionals from CIBC Mellon for choosing Canada's sixth-largest city to expand service offerings, create jobs and offer excellence in service to clients," Mississauga Mayor Bonnie Crombie said. "Financial services is one of Mississauga's leading industry clusters and the arrival of CIBC Mellon, a world-class company, is proof Mississauga's economy remains strong and that our city is a leading destination for businesses to remain ahead of the competition and have greater access to hiring smart, hardworking and qualified individuals." The space at CIBC Mellon's Mississauga office was designed by WZMH Architects. In 2015, CIBC Mellon was named one of Canada's 50 Most Engaged Workplaces, earned a Canadian HR Award for "Best Reward and Recognition Strategy," and was recognized at the 2015 Employee Engagement Awards for "CSR project of the year" by engaging two-thirds of its employees in paid-time off for volunteering during regular working hours. The company has been named "best sub-custodian" by Global Finance magazine for ten years in a row, and to date in 2016 was ranked #1 in Canada in the Global Investor / ISF global sub-custody survey. Jobseekers can explore the CIBC Mellon experience at CIBC Mellon at www.cibcmellon.com/careers or follow the company on Twitter at @CIBCMellon. CIBC Mellon is a Canadian company exclusively focused on the investment servicing needs of Canadian institutional investors and international institutional investors into Canada. Founded in 1996, CIBC Mellon is 50-50 jointly owned by The Bank of New York Mellon (BNY Mellon) and Canadian Imperial Bank of Commerce (CIBC). CIBC Mellon's investment servicing solutions for institutions and corporations are provided in close collaboration with our parent companies, and include custody, multicurrency accounting, fund administration, recordkeeping, pension services, exchange-traded fund services, securities lending services, foreign exchange processing and settlement, and treasury services. As at June 30, 2016, CIBC Mellon had more than C$1.6 trillion of assets under administration on behalf of banks, pension funds, investment funds, corporations, governments, insurance companies, foreign insurance trusts, foundations and global financial institutions whose clients invest in Canada. CIBC Mellon is part of the BNY Mellon network, which as at June 30, 2016 had US$29.5 trillion in assets under custody and/or administration. CIBC Mellon is a licensed user of the CIBC trade-mark and certain BNY Mellon trade-marks, is the corporate brand of CIBC Mellon Global Securities Services Company and CIBC Mellon Trust Company, and may be used as a generic term to refer to either or both companies. For more information visit www.cibcmellon.com or follow us on Twitter @CIBCMellon.